me, JulieG, and Judy from It's Judy Time, they are the sweetest girls, and I had such a great time with them! Thanks girls foe being so nice and fun! me and a scary pirate! and on the walk back from dinner, with Judy and Julie...look what i saw...they were prepping the room and the sign was up that says: KANDEE JOHNSON'S GLAMINAR!!!! I was so excited! We walked around the room and i am soooo excited...! Like every glaminar, i'll probably only be able to sleep for a few couple hours! soooo excited!!!!! huge love, great dreams, and thank you to EVERYONE that came up and said hi, let me hug them, and share their inspiration! I truly do love you all!!!! you look beautiful! and you look like you've lost weight!! LALALALA.... i waited at the urban decay booth to see you! and my golly... u did show up! i love u kandee!!! it was sooo nice to see u in person... im glad to see the happy person behind the awesome blogs! u r so beautiful... on the inside and out.... i will post the pic of u and me and show u... i hope ur leg didn't bother u all day. IMATS looks like fun! I'm thinking of flying up to Sydney for the one in Australia... better start saving up!! i wish i could have been there to meet you !!! it looked like so much fun !!! I wish I could have been there :( you look beautiful! IMATS seems to have been awesome! I wish I lived in the US to go! Hahaha. But hey, someday I may visit. Kandee, you're so adorable, you treat us (your fans) so nicely! Love you!! btw, your mom is GORGEOUS! and I hope Glaminars goes great!!! Koren is soooo sweet. I had the pleasure of meeting him last year at the Makeup Show in New York City. lot of fun in the photos! Yay! Great pix! I hope I can attend a Glaminar one day!! IMATS was super fun and it was great meeting you and your mom. 40 years old and new career? I think I'll like this gig. Kandee, this is probably going to be ackward because I don't give or recieve compliments all that well. But, you have brought so much joy and hope in my life. I love your make-up tutorials, not because they are teaching me how to make myself more beautiful. But, they teach me how to make myself FEEL more beautiful. I have dealt with crushing depression and awfully low self esteem during my twenties and I am just now coming out of that. I found your videos about a month or two ago and your blog not long after. You are such a positive person despite some things that you have been through and that brings me so much hope for my life. Your blog, your videos, your pictures, they all give me hope that I can continue to overcome the depression and bipolar that have held be back from living my dreams and living the best life that I can live. You have helped me see that it is possible. I thank you Kandee, and if it were possible, I would give you the biggest hug I can muster. Congratulations! You are an inspiration to all of us out here trying to carve a place for ourselves in this crazy and amazing world. Keep weaving your life! too bad that I was not there :( it will be awesome to meet you :) the little things you show to me are taking me over ! Oh,Kandee... I wish I could be there and say hello and hug you! I wish I could visit IMATS and your Glaminar. But, actually, I live in Russia, so I have no opportunity for that. Love you, you're so amazing and kind, thank you for the inspiration!!! You are the best!! Love you! Have a super fun time at the glaminar, maybe one day i get to go too. That would be a dream come true. Love you Kandee, I only wish the best things in life for you. awww you and your mom are so cute and pretty! I'm sure you've heard it a million times, but your mama is so gorgeous. It is obvious where you get your stunning looks from! Such a cute mama daughter team! Good luck with the Glaminars Kandee, Lord know's I wish I could go! It was so awesome meeting you at IMATS and the Glaminars! You were exactly the amazing person I thought you would be. Thank you!! Today was awesome! You and your mom are so sweet! I didn't want the day to end! I wanted to just hang out and listen to you forever. Fun fun fun day! Im sad I didnt get to take a pic w u... But i live in LA and hopefully can see u again. I gave u the black and white polka dot bag w the two scrub towels. I hope u like them. They are awesome to use in the shower. Totally leaves ur skin soft and great if u use self tanner. Well again thank u so much for everything. Everyone was great. Thank u for being our angel here. 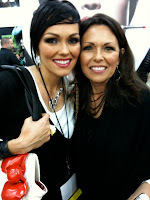 Kandee you are such a great person. More people in this world need to be like you!! I love reading your posts. I read some to my mom and we always end of teary eyed! They inspire me everyday! You have taught me sooo much and I cherish you for that. I love you!! I am having a contest on my website which is running right now, and it is also running on my You Tube which starts on July 6th! It's sponsored by Jaguar Luxury Cosmetics, and its to win free makeup! I hope that you can enter! 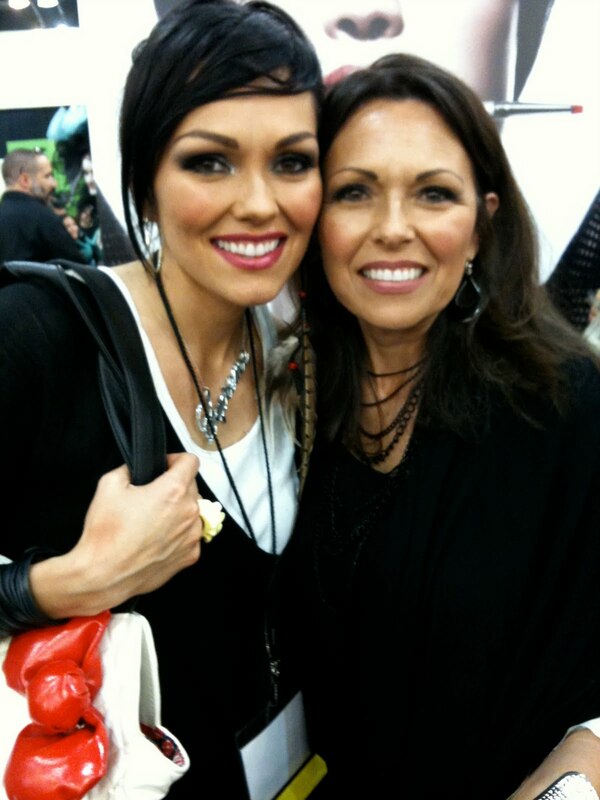 You are so beautiful Kandee :). Looks like you made a lot of people happy. Ohh My Gawsh ! When I went to get my press pass for IMATS inside the hotel I saw you giving the Glaminar and talking on stage! (I peeked thru the doors!) I was super star struck! I also saw your mom standing outside at the table and she is beautiful!! You are my inspiration!! You rock! Unfortunately I could not make it to your wonderful glaminar! I hope I can go next year! Props for continuing to inspire many hopeless and hopefuls. You are possibly the most gorgeous young women i have ever seen. I think you should be able to see it with that url. If not, my blog is sharonspringoh.blogspot.com so you can look there! Thank you again and I hope your weekend with Glaminars was awesome! Thinking about your leg wound. I love watching your youtube videos on hair and makeup, but I'm here now to tell you that you are so DARN CUTE! Really, the cutest girl. So than you don't have to have a license in anything to go to shows if JulieG, and Judy from It's Judy Time was there. This is just amazing..! You're a gift Kandee, a wonderful gift from God for us to feel better inside everytime we hear You or read Your thoughts.. It's priceless gift when someone makes one back to faith in his abilitys and You're doin' this every single day! and this is honest, inborn and full of good energy!I'm grateful for You and for all theese people that leave comments here.You all make this world beautiful! just kidding- I changed my blog's url to honorahs.blogspot.com. just in case you try to access it! Have a great week Kandee! I actually subscribe to Judy's youtube and blog so I was really excited to see you on her video before i read this blog! how cool 2 of my favorite make up people at once! must have been fun. i LOVE you kandeeeeee you are one of the most inspirational gurus out there, keep spreading ur love cuz even small things can go far :) keep it up!!!!! Ok I just realized I can delete it myself so I did lol..
You are﻿ an inspiration to all the girl's that watch your channel. Please do a tutorial on the look you wore in this blog, I would LOVE it. :) I NEED you to do a tutorial for this makeup look!